Drobo FS Beyond Raid 5-Bay Gigabit Ethernet SATA 6GB/S Storage Array works great with no issues, ships with power adapter. Ships Diskless, no hard drives included. Condition is Used. Shipped with USPS Priority Mail. Easiest-to-Use Network Attached Storage. Like all Drobo storage products, Drobo FS provides redundant data protection without the complexities of RAID. We call this BeyondRAID technology. You'll call it peace of mind. Condition is Used. Firewire 800, USB 2.0, Ethernet and power cabled included. DRIVES NOT INCLUDED. Drobo 2nd Gen Storage Array. •DROBO Tote bag. Marvell 500 MHz System-on-a-chip (SOC) processor (Marvell 88F5281-D0). •USB 2.0 / FireWire 800. •One USB cable. •One drive bay door is missing (not needed when there’s a drive in it, which is like, always). Drobo DDR3-A. I ncludes4 X 500gb Seagate SATA Drives. Y ou p ay s hi pp in g. I ca n re mo ve t he h ar d dr iv es f or c he ap er s hi pp in g if y ou w ou ld p re fe r.
This ensures your important information is safe and sound. Drobo takes upgradability to the next level. Built on award-winning BeyondRAID technology with single or dual-drive redundancy, Drobo protects your data without any user interaction. System was in use very recently. No HDD's included. This hard drive device was opened for inspection and photographs. The outside of the original box has scratches and scuff marks from storage. Drobo 4 bay, GEN3 model. Works great, never had any issues with it. Drobo connects to your computer or network and provides redundant data protection without the complexities of traditional RAID. Drobo USB 3 in Excellent condition. Includes Drobo enclosure, power and USB cables in factory box. Unit have normal wear and tear. Backup and protect all your important files and pictures. If any drive fails all your data is protected. Item may have scuff marks which does not impact functionality. Data Robotics DROBO DR04D-U 8TB Storage. Drobo 5N (DRDS4-A) Network Attached Server NAS - 5 bay - NO DRIVES New Open Box! 4 out of 5 stars - Drobo 5N (DRDS4-A) Network Attached Server NAS - 5 bay - NO DRIVES New Open Box! 1 product rating1 product ratings - Drobo 5N (DRDS4-A) Network Attached Server NAS - 5 bay - NO DRIVES New Open Box! Scalable desktop storage array. Expandable by adding drives or hot-swapping drives with larger ones. 1 x USB 3.0 port, Type-C. Includes USB 3.0, Type-A to Type-C Cable. Item ID: S57269. 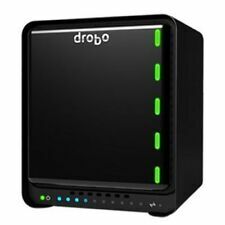 DROBO DRDR3A DATA ROBOTICS , INC. Condition is New. Shipped with USPS Priority Mail. Condition is LIKE NEW. Never used, just kept in its box. With lightning speed ThunderboltTM 3, the Drobo 8D is the fastest direct attached Drobo yet. Features Leave Your Limitations Behind. Go BeyondRAID® Built on award-winning BeyondRAID™ technology, Drobo 8D simply protects your data against a single or dual disk drive failure. 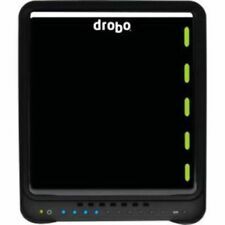 Data Robotics Drobo FS DRDS2-A - No Hard Drives included. Condition is Used. Shipped with USPS Priority Mail. Data Robotics, Drobo. Drobo DRD5-A. Missing Hard Drives. Device has been reset to factory defaults. If it's not in the pictures, it's probably not included. Whether it's a laptop, desktop, LCD, printer or one of our other amazing deals, each piece is coming to you off-lease. Drobo isci array. Included Not Included . USB cable (for initial setup). Ethernet Cable. Drobo dro4d-d 4 Port, USB 2.0. NO HARD DRIVES. Sunnking, Inc. is an R2/RIOS certified electronics recycler. This item has been tested for functionality and is in working condition. NO ACCESSORIES INCLUDED! Rackmount is included. No Drives included! Supports SATA drives up to 4TB. Hard Drives. Solid State Drives. Asset recovery and recycling services. Printer Parts. Point of Sale (POS). It gives you enhanced availability and serviceability for a smooth and uninterrupted operation. Instant expansion. This is a Drobo DDR3A21 Direct Attached 4 bay array USB 3 port Storage. Br and NEW, NEVER USED! Box has been opened but Drobo never powered up or used. Unit was factory reset and is ready to accept drives. Drobo 4-Bay. get Dbobo Dashboard Software @ Drobo website. 4x500Gb Drives Installed 2Tb. Includes OEM AC Adapter, USB FW Cable. USB 2.0/FireWire 800 Storage Array DR04D-D. Enhanced USB 2.0 performance. Very good condition. Missing original box and ac adapter. Drobo B800FS 8-Bay Array NO HDDs. What is pictured will be what you receive. NO HDDs Included. DROBO B1200i Fan Assembly DR-B1200I-1F11. DROBO B1200i Expander Card DR-B1200I-1F11. Drobo B1200i Fan Assembly. DROBO Part # 908-70002-001. Drobo Part # 908-70002-001. During the warranty period any item found to be defective will be repaired or replaced. Unless otherwise stated, this has been tested for key functionality. This has been tested and it is in good working order. I am guessing that if you’re looking at this that you’re already familiar with Drobo. Your only hope is to get another Gen 1 Drobo and mount the drives in it so that Drobo’s proprietary software can read it. Drobo 4-Bay. They are formatted and ready to use in the Drobo. I’m including 4 Hard Drives (Total of 5TB). Three 1TB Drives. Fan runs a little noisy. Data Robotics, Inc. Powers on. Input: DC 12V-6.6A. Drobo B810N w/ 8 WD 6TB WD60EFRX RED NAS Drives. Drobo B810N 8 Bay NAS Array. This item is a Drobo B810N with 48TB of Storage. Drobo B810N. Drives- 3 Year Manufacturer. Drobo 1 Year Manufacturer. Drobo Unit 1 Year Manufacturer Warranty. Storage Array is in fair condition and is guaranteed. Item has heavy wear from previous use including scuffs and scratches. There is some writing on bottom of unit. Locking mechanism on bottom of unit is broken. Photos of actual item for sale. Item is on hand and ready to ship. This storage server was plugged in and tested. It has a couple scuff marks on it from use.